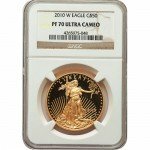 Unless you are new to coin-collecting, the American Gold Eagle is one of the most recognizable coins you will ever come across. Introduced in 1986, around the same time many other nations were trying out gold coin production, the American Gold Eagle quickly rose through the ranks and became one of the top gold coins in the world. Nowadays, the coins are still being produced annually, with certified editions receiving more and more attention every year. 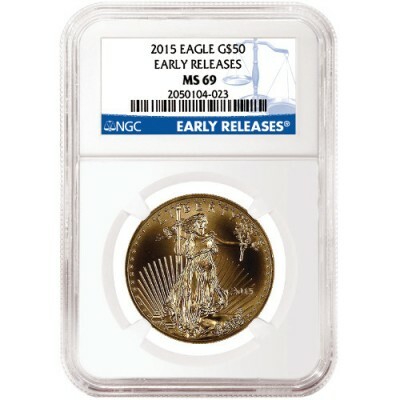 The coins offered for sale here are 2015 1 oz American Gold Eagles that have been graded as being MS69 by the NGC. For those unaware, the NGC is one of the top coin-grading companies in the world. Available in near-perfect MS69 condition from the NGC. Though each passing year brings with it a new American Gold Eagle, the design of the coin has not changed much at all. On the obverse you will find the extremely detailed image of Lady Liberty walking across a sunlit backdrop. On the coin’s reverse you will dee the imagery of an adult American Eagle delivering food to another nesting bird. In addition to all of this imagery, you will also see indications marking the coin’s 2015 year of minting, 1 oz weight, and $50 face value. Being that these coins are produced year in and year out with little design alteration, one may be led to believe that there is no rush to get your hand on them. The reality, however, is that only a select number of 2015 1 oz American Eagle coins are graded by the NGC to be MS69, so the best time to act is now. If you wait too long, you may no longer be able to purchase the certified Gold Eagle which you desire. If you have any questions about these American Gold Eagles, or any of our other US Mint products, we encourage you to reach out to our customer service staff toll-free at 888-989-7223. You may also make use of our live-chat feature as well as our online contact form.